View of Farm Pond, looking out the back. 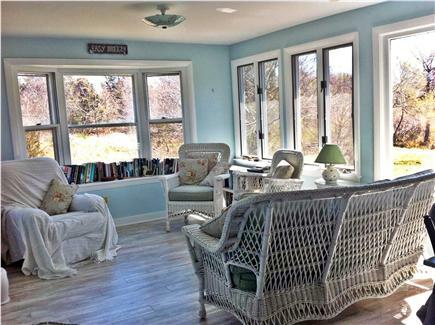 The sunroom, with water views, wicker chairs and lots of books. Getting ready for a wonderful meal at Easy Breezy. The porch wraps around, providing views every which way. View of Waban Park. 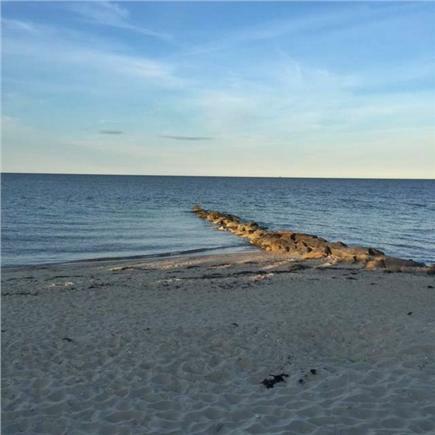 It's long and fronts on Nantucket Sound. Victorian bedroom with queen bed and balcony. The upstairs back bedroom, looking out to Farm Pond. The ''little kids'' room with twin beds. Downstairs bathroom, with shower.There's an outdoor shower too. 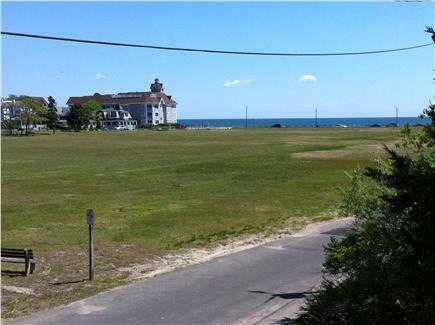 The beautiful Oak Bluffs beach at the end of the road. 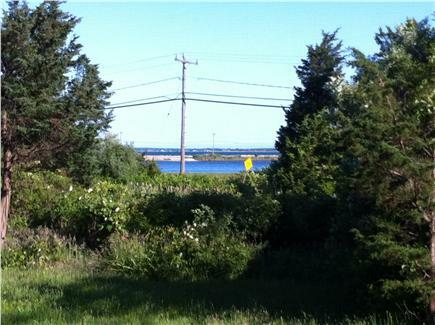 Looking at Easy Breezy from Farm Pond. 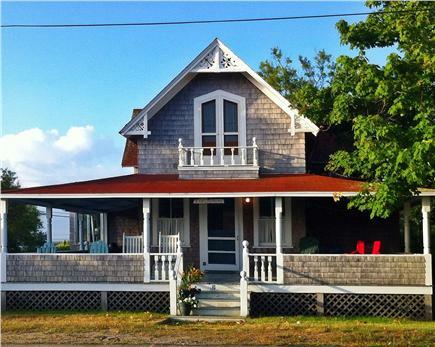 ''Easy Breezy' is the quintessential Oak Bluffs Victorian cottage--large, open, airy, totally relaxing, and apparently remote, but also close to everything. It looks out on Waban Park, in the Copeland historic district, has four bedrooms, views of Nantucket Sound and Farm Pond, an unbelievable wrap-around porch, and a large yard for badminton, croquet and grilling. The beach is a short walk down the road. It's also a quick walk into town, to the Ferry, and to the Camp Grounds. Also, you can bike anywhere. 'Easy Breezy'' has an easy and breezy layout. Many windows, rooms, and places to hang out, plus lots of privacy. The first floor has a huge living room with cable TV, Wi-Fi, piano, couches, and a game-playing area. The wicker room offers a different feel: beautiful views, amazing sun, cozy chairs, and lots of books. 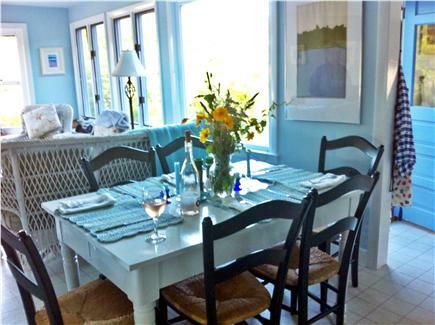 The kitchen has been recently updated and is next to the dining area. Both have great water views. 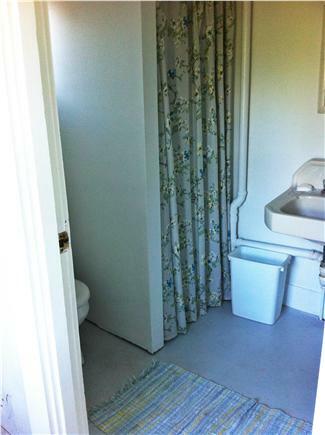 And there's a downstairs bathroom, with shower, and a convenient laundry area. Fall renters will enjoy the Jotul (gas) fireplace. 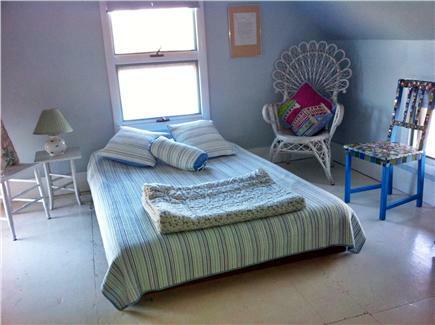 Bedrooms are arranged well for families and visitors. 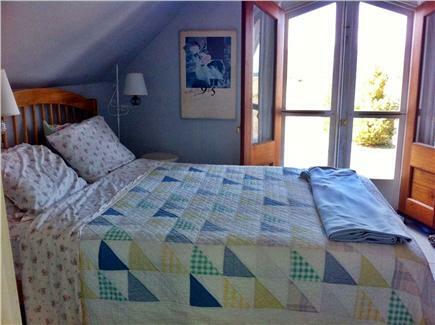 The first floor has one large bedroom with twin beds and a separate entrance. 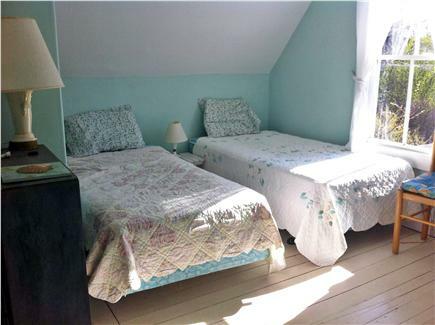 Upstairs has one Park-facing Victorian bedroom with balcony and queen bed, one Pond-facing bedroom with double bed (and an extra pull-out), and the charming 'little kids' room, with twin beds. The upstairs bathroom also has a shower. 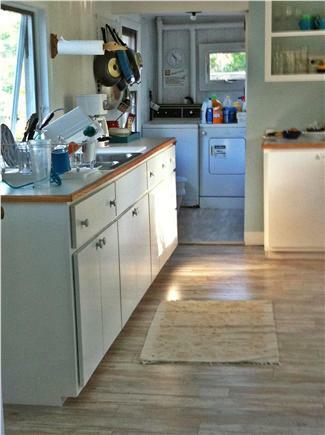 Other amenities include a washer/dryer, BBQ grill, and an outdoor shower - and linens are provided. 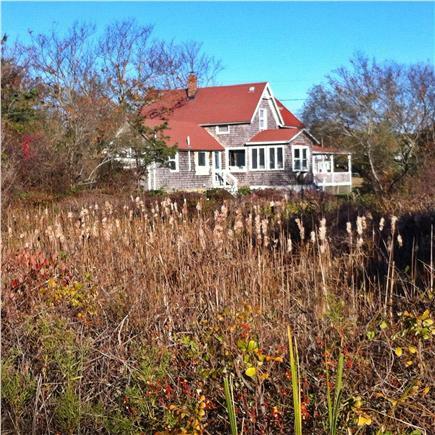 Stroll to the beach for a swim, walk into town for ice cream, or just stand in the sunroom and gaze at a Great Blue Heron on Farm Pond. Additional pricing info: 1.Discount for multiple weeks. 2.Lodging tax legislation, if passed, may alter prices. State and local taxes of 11.7% will apply. First floor bedroom, bath and shower. I have been staying at the "Easy Breezy" for 10+ years now. It doesn't take long to fall in love with this charming home. Our evenings are spent telling stories and chatting on the wrap around porch. The kitchen is fully stocked and ideal for making family meals. 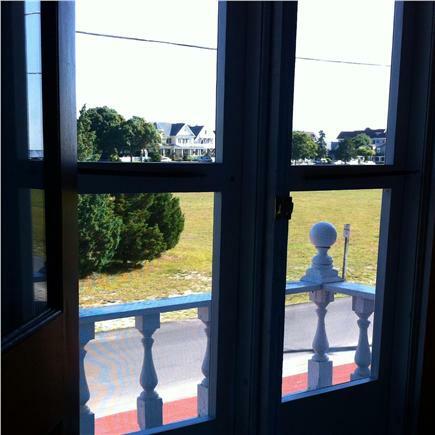 Windows are always open and ready to catch a breeze blowing in from the ocean. 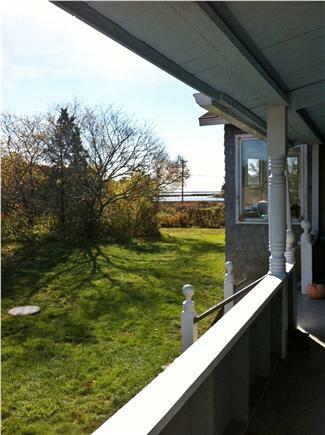 Situated on a quiet lot, yet walking distance to downtown and the beach. The location of this house cannot be beat!